The Camco Water Hose had 1817 customer comments and 112 answered questions on Amazon as of this writing. I've read through the comments and condensed the results into this report. I hope that this helps you when shopping for a hose. The Camo Water Hose is a heavy-duty hose that is 20 percent thicker than a standard drinking water hose. It is drinking water safe, lead free, BPA free, phthalate free and leaves no strong plastic taste in your drinking water. Featured are machined fittings and strain-relief ends for added durability. Also featured is a UV stabilized for longer life. This hose is NSF certified and also compliant with all federal and state level low lead laws. The Camo Water Hose is safe to use for drinking water. That means that you can safely use it to fill up your RV and also water containers. Many of the hoses I reviewed were labeled as not safe for drinking water, so the fact that this one is safe for drinking water is truly an asset. One customer shared this feedback, "High quality is evident the moment you open it. It is apparently marketed to deliver potable water to RV campers...I respect anyone who makes a reinforced hose safe enough for drinking water. I like rewarding high quality, which is why I wrote this review." The price on this hose really can't be beat. It is a small fraction of the cost of many other hoses with similar qualities. A comparison shopper commented this about the price, "Also check the prices, this was the best deal per foot. Sometimes you don't need 100' but its sure nice to have." You may not think "Doesn't Leak" should be a topic under a hose review. I mean, all new hoses certainly shouldn't leak, right? Well, yes, they shouldn't leak but some of the hoses I reviewed had a massive amount of people say that it leaked. This is not one of them. Customers reported that the Camo Water Hose does not leak. Here is one of many similar comments on how this hose does not leak, "So I bought this hose which seems very strong. It won't spring a leak if you accidentally step on it or it catches on a little rock. It is working fine - it is just very inflexible and rather heavy. It gets twisted and then it is very hard to straighten out. But I feel, at least, this hose will last a long, long time." I guess nothing is perfect, including this hose. It will kink on you if you twist it and don't keep it laying out straight. It didn't seem like this was a big complaint, though people did mention that it kinks. To me, a hose that leaks is a deal breaker, but I am ok with kinking. The majority of people who reported that it kinked, sandwiched it in between good qualities that it displayed. Here is one of many of the kink comments, "Better quality than others we have bought which still added vinyl taste to the water. It's a bit stiff and hard to handle, still tends to kink, but no vinyl taste/odor and is long enough to fit without having to connect two hoses." A consistent topic that I kept coming across was how durable this hose is. It has also been commented on that it is heavy, but people pretty much forgave the heavy factor because it was so durable. Here, a customer shared why they approved, "I've had a lot of leaky water hoses over the years. Even a few so called "made in USA" that last for 6 maybe 8 months before you have to cut off one end or the other (or both) and pipe clamp a replacement fitting. This thing looks like it was built to survive Armageddon and it works great so far. A bit stiff, but that sort of goes with the territory when the pipe is this rugged. So far, a month in direct sunlight, under pressure 24/7, and not a hint of trouble." The Camo Water Hose is a heavy-duty hose that is built to last. Customer commented that it does not leak and seems to be very durable. However, it will kink as many hoses do. This is one of the few hoses that I reviewed that are drinking water safe. That means that you can use it to fill up your RV or do any kind of transporting of drinking water that you need to. It is free of BPA, Lead and Phthalate. 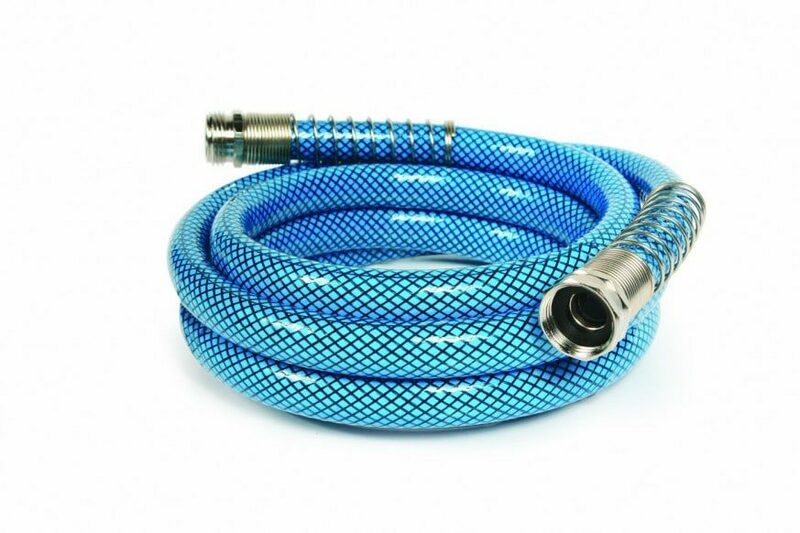 One of the best features that I kept coming across for this hose is that it is very durable. It's a bit on the heavy side, but that is also what many people believe makes it durable. Here are some top questions that I found for people considering buying a Camco Water Hose. What is different about a drinking water hose and garden hose? Regular garden hoses contain lead in the PVC used to make the hose itself. The brass fitting also contains lead in many garden hoses. Studies have been done that show a large amount of lead leaches from the hose into the water as it passes through. Lead consumption is not healthy for humans. It is best to buy lead-free hoses for both your RV and your garden. What is the pressure rating of the 5/8 inch premium drinking water hoses? The working pressure rating is approximately 50psi and we recommend a pressure regulator over 50psi. The burst strength rating is 300psi. Is this lead free or low led? The hose is lead free although the connections are made from brass, with a nickel plating. All brass has a certain percent of lead. You cannot totally remove it.